All and sundry will be looking for wins this weekend as each of the clubs will be hoping to make the most of their last chance in the first round of out-of-zone games in the Barbados Premier League. Getting started around the middle of December last year, teams in Zone 2 were the ones to make the most of the cross-zone clashes, running away with the lion's share of the points up for grabs. Now they sit well ahead of their Zone 1 counterparts. In Zone 1, the University of the West Indies Blackbirds lead the roost with 15 points from four wins, three draws and three losses. Their most recent game saw them knocking Scotty's Car Rentals St. Andrew Lions down a peg after they were on a runaway winning streak. One point behind are the two-time defending champions, Weymouth Wales, who have their 14 from four wins, two, draws and four losses. 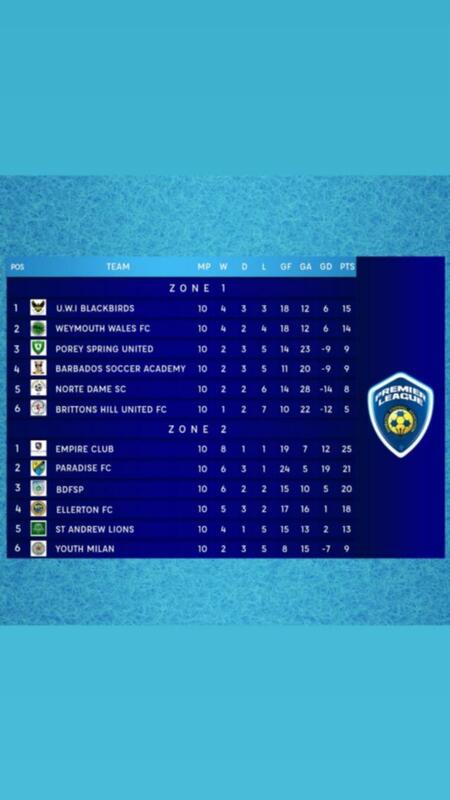 After leading the group for the first few weeks of the competition, they were sent stumbling to four losses on the trot which they halted last weekend when they handed Paradise FC their first loss of the season. Mark's Auto Spares Porey Spring and RBC Capital Markets Barbados Soccer Academy are third and fourth in the group with nine points each. Two wins, three draws and five losses give the teams their totals and they both have a goal-difference of -9. It is the goals scored that set the two apart as Porey Spring have 14 and Soccer Academy have 11. At the bottom of the barrel are Clayton's Kola Tonic Notre Dame and Brittons Hill United as the teams round out the zone with eight and five respectively. The Dames got their points from two wins and two draws while losing six of their games, and Brittons Hill only have a win and two draws to show for their efforts in 10 games. These two are sure to find themselves in the relegation play-offs if they cannot turn things around. In Zone 2, Empire Club are still on top of the world as they lead the group with 25 points. They have the best record so far this season with eight wins, one draw and one loss and are solid contenders for the championship. Paradise FC (21) are holding the form that saw them take away the Champions Cup last season and are still in the running for the Premier League title. Rolling on an unbeaten run this season that was only ended last weekend when they met up with Weymouth Wales, Paradise's record now reads six wins, three draws and one loss. The Barbados Defence Force Sports Programme are not too far off the pace with 20 from six wins, two draws and two losses. Crane and Equipment Ellerton are next in line on 18 points. They have five wins, all of which they picked up in their last five games, three draws and two losses. St. Andrew Lions are fifth in the group with 13 points after having their four-game win-streak ended last weekend. Before that they had one draw and five losses. The only team in Zone 2 to not make the most of playing outside of their zone were Youth Milan. They have two wins – both of which came inside their zone – three draws and five losses. This coming weekend at the Wildey Turf, Ellerton and Porey Spring have the first date at 5:00 PM on Saturday. This one will be a little too hard to call as they are evenly-matched, however, Ellerton have the momentum of a five-win streak on their side. Game 2 will feature Empire and Brittons Hill and this one is expected to be a straightforward game given records on both sides. Saturday's nightcap will see the Lions taking on fellow top-tier debutantes Barbados Soccer Academy. On Sunday, the most exciting game should be the one between Paradise FC and the Blackbirds at 4:00 PM. In the middle at 6:00 PM are Weymouth Wales and Youth Milan, while the 8:00 PM clash will see he Sports Programme taking on Youth Milan.